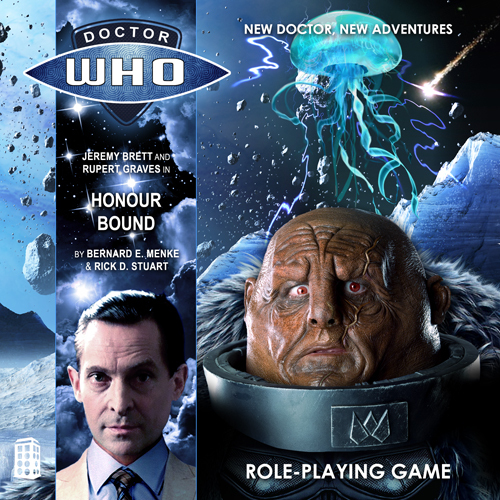 Synopsis: Held as prisoners of the infamous General Rannic, the Doctor and Riddell find themselves forced to serve the Second Sontaran Battle Fleet! Their mission: to locate an intelligence operative who has gone missing during a return from the front in a never-ending interstellar war. If the Doctor and his companion should refuse to live and fight as Sontarans it will mean summary execution, but the frontier planet on which their fateful rendezvous is destined to take place promises its own life-threatening dangers. Caeraedor is a world in the depths of a brutal ice age, a planet of monstrous predators and unforgiving elements. Concealed within its ice caves is a terrible secret that could mean victory or defeat for a desperate Sontaran Empire. This entry was posted on 20/09/2016 by hedgewick. It was filed under The Lost Doctor and was tagged with Episodes, Honour Bound, Kyrstal, Riddell, Rutans, Sontarans. Another great story. I’m curious. What happened to the Master ? Did the Master leave with his Android body or a new body entirely? The Master remains an android–and, for the moment, remains confined to the interior of his TARDIS. It’s certain that, now that he’s gained his freedom, all of his efforts are focused on overcoming these limitations.